Tiruchendur Murugan Temple is an ancient Hindu temple dedicated to Lord Muruga at the site of the battle. It is one of the six major abodes, or sacred temples, of the Kaumaram religion. Soorasamharam, a reenactment of the victory over Soorapadman, and Kanda Shasti, a devotional song in praise of Lord Muruga are performed at the temple. Tiruchendur means sacred and beautiful town in Tamil. The temple is dedicated to Murugan, the second son and warrior deity of Shiva. When Muruga came here for the conquest along with his army, he found it to be very small and ordered the celestial architect Viswakarma to expand it. 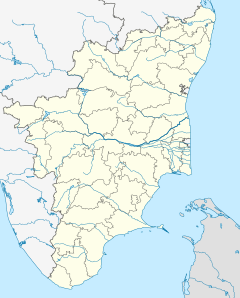 The town came to be know with several names like Tiruchendil, Jayanthipuram, Thiruchilavay and Srisandhinagaram. It is believed to be the place where Muruga conquered the demon Surapadma. It is believed that the demigods of Muruga wanted to worship him in a place where there was a mountainous tract, sea and river and hence Tiruchendur was chosen. The temple, which is built near the seashore, measures 91 m (299 ft) north to south, 65 m (213 ft) east to west, and has a seven-tier gopuram, or tower gate, that is 42 m (138 ft) high. The principal entrance faces south, and opens into the first of two prakarams, the first of which is lined with rows of Yalis. The inner sanctum of the temple is in a cave and the main deity, or moolavar, is Murugan as a saintly child, portrayed in a granite carving. Naazhi Kinaru, a sacred well fed by a freshwater spring, is located 100 m (330 ft) south of the temple. Devotees undergo a ritual cleansing by bathing in water from the well after bathing in the ocean. The Murugan temple at Thiruchendur was occupied by the Dutch East India company from 1646 to 1648, during the course of their war with the Portuguese. The local people tried to free their temple, with no success. The Dutch finally vacated the temple on orders from the Naik ruler. However, while leaving, they removed the idol of the main deity of the temple, and took it with them. During their way in sea, they encountered a strong storm and realised their mistake of stealing the idol. They dropped the idol in the middle of the sea and seen the storm stopped immediately. Later, Lord Senthil Aandavan appeared in a dream to Vadamaliyappa Pillai, an ardent devotee of Muruga, and revealed the place in the sea where the idol had been abandoned. Vadamlaiyappa Pillai and Athitha Nadar, a sponsor of services in the Thiruchendur temple, went to the spot in a fishing boat and retrieved the idol in 1653. The story is shown in paintings inside the temple. ^ "ISO accreditation for Tiruchendur temple". The Hindu : NATIONAL / TAMIL NADU. Retrieved 4 December 2016. ^ Ayyar, P. V. Jagadisa (1993). South Indian Shrines: Illustrated (2nd ed.). New Delhi: Asian Educational Service. p. 500. ISBN 81-206-0151-3. ^ Knapp, Stephen (1 January 2009). Spiritual India Handbook. Jaico Publishing House. pp. 387–. ISBN 978-81-8495-024-3. ^ a b Clothey, Fred W. (1978). The Many Faces of Murukan̲: The History and Meaning of a South Indian God. Walter de Gruyter. pp. 121–. ISBN 978-90-279-7632-1. Retrieved 5 September 2016. ^ Vink, Markus (2015). Encounters on the Opposite Coast: The Dutch East India Company and the Nayaka State of Madurai in the Seventeenth Century European Expansion and Indigenous Response. p. 347. ISBN 9789004272620. Wikimedia Commons has media related to Thiruchendur Murugan Temple. This page was last edited on 3 March 2019, at 16:02 (UTC).